For thousands of years, astronomy and astrology were the same science. 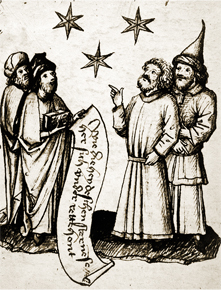 Astrologers sought to understand the physical nature of the stars and planets, as well as man’s place in the universe. Most of the Renaissance astronomers at the dawn of the scientific revolution were also astrologers. Johannes Kepler, Galileo, and Tycho Brahe all were practicing astrologers. Others, such as Isaac Newton, didn’t practice but were well-versed in astrology. With the advent of the Age of Enlightenment and new discoveries about the nature of the solar system, astrology fell out of favor. Today, astronomers are highly regarded, while astrologers are associated with gypsy fortune-tellers and telephone psychics. The mere mention of astrology is often met with spontaneous ridicule and disdain. The United States government officially classifies astrology as a “superstitious pseudo-science” that appeals to only the poor and uneducated. That sounds reasonable, but is it really true? This documentary will reveal a very different story about a hidden profession and its clientele. In the United States alone, there are an estimated 10,000 full-time astrologers, and thousands more who work part time. Laura Nalbandian, a second-generation astrologer and coordinator of the annual Northwest Astrology Conference in Seattle, knows most of the world’s leading astrologers and can rattle off a long list of impressive credentials: Ph.D.s in math and history, degrees in classical studies, Jungian psychology, business, and finance. Nalbandian and others attest to the intelligence and education level of their clientele, who have money to spend on sophisticated astrological services – everything from detailed financial and medical advice to career and personal counseling. But they typically don’t talk about it, given the public perception of astrology. Although the roots of the bias against astrology run deep, the world is on the cusp of a shift in cultural awareness, in no small part due to advances in science that allow physics and metaphysics to coexist – ironic, given that the original split between astronomy and astrology occurred due to the scientific discoveries of that time. There is a growing acceptance of astrology by academics – at least, the more research-oriented, rigorous approach to astrology and not the popular horoscopes found in the entertainment section of newspapers and on the Internet. Astrologers are found on the staff of legitimate medical organizations, and Wall Street traders regularly follow the advice of financial astrologers. A recent article in Forbes attests to growing acceptance and intellectual curiosity in the mainstream. This thought-provoking and controversial documentary takes a serious look at the serious profession of astrology. Whether or not you believe in astrology, you’ll be fascinated by this inside look at the lives of some of the world’s leading astrologers.